1969 JAGUAR XKE SERIES II 2+2 FIXED HEAD COUPE – Daniel Schmitt & Co.
ONLY 2 OWNER FROM NEW! MULTIPLE SHOW WINNER; OVER 16 AWARDS! MANY 1ST PLACE SHOWINGS, INCLUDING JCNA NATIONALS! ORIGINAL OWNER WAS THE PRESIDENT OF THE JAGUAR CLUB OF AMERICA! 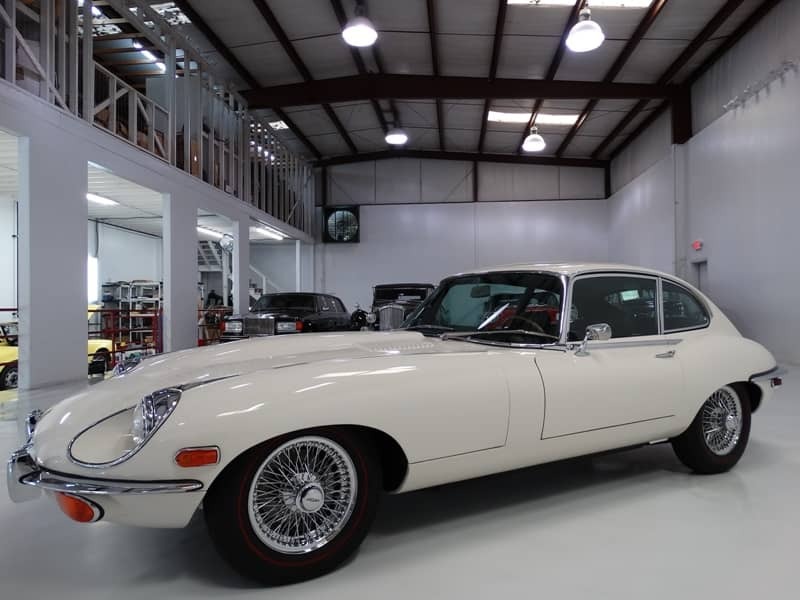 DOCUMENTATION INCLUDES: KNOWN SERVICE HISTORY SINCE NEW, OPERATOR'S MANUAL, MAINTENANCE BOOKLET WITH SERVICE STAMPING, ORIGINAL BILL OF SALE & REGISTRATION, ID PLATE, JAGUAR HERITAGE CERTIFICATE, AND MORE! SIMPLY ONE OF THE NICEST EXAMPLES OF THIS ICONIC MODEL TO BE FOUND ON THE MARKET TODAY! Finished in stunning Old English White with an impeccably-kept original black leather interior, this magnificent motorcar is a multiple show winner with over 16 awards, including JCNA Nationals. The meticulous original owner was the president of the Jaguar Club of Oregon, as well as a Jaguar Concours judge. This is an incredible opportunity to acquire one of the most well-documented, award-winning, Fixed Head Coupes on the market today. We are proud to offer it to the most sophisticated collector, investor or enthusiast who demands the best. Ready to make an investment that you can actually enjoy? According to Motortrend, the classic car market has recently shown more growth than hedge funds, with projected returns of 161% after five years and a whopping 467% after a decade. Please contact one of our expert sales consultants for more information. They will be happy to give you a complete walk-around, supply you with a more detailed description, and answer any questions that you may have. Bid with confidence; you will not be disappointed in this truly exceptional Jaguar.